The College Board announced starting in 2015 that no longer could professional tutors come in, take the test, and apply what they see to their for-profit businesses. The fact that the students-only policy sent dozens of high stakes test prep corporations into a tail spin amuses some people. For the team at GATE, it was just another sad reminder of how corporate greed impacts the economic disparity in this country. Here’s why. The ubiquitous nature of such devices, even among the neediest teens in our communities, makes this a thrilling time for those bringing educational technology solutions to the market. With every click, a teen is empowered to choose or reject options that are presented. Will they embrace this curriculum or that? One teacher or another? Suddenly instead of being relegated to digging for scraps, every beggar can potentially become a guest at the table of opportunity. While most high school seniors impatiently await regular admissions and deferment correspondence (“not the dreaded wait list…nooo!”) college counselors are anxiously awaiting further developments in admissions upheavals like changes to the SAT, federal student aid application modifications, and new challenges to face like the Coalition App for Access, Affordability and Success. According to venture capital database CB Insights, billions of dollars are invested annually in educational technologies. Naturally, the ed-tech arena has been a great, untapped frontier – a veritable gold rush of Johnny-come-latelys to the education world, eager to pan for gold in “them thar hills”. At GATE College System, the team knows from the inside track that admissions counseling from qualified educators is the key to narrowing the playing field for an applicant with minimal access to personalized guidance at his or her secondary institution. We are not entirely convinced that corporations, tech experts, and others who lack experience on the front lines of secondary education are qualified to lower the bridge to access. Let’s hope that the right solutions from the right professionals with the right intentions make their ways onto smart phones for the sake of students like Raul whose lifeline to a better future can be, in these days of ed tech, as near as their own tattered pockets. 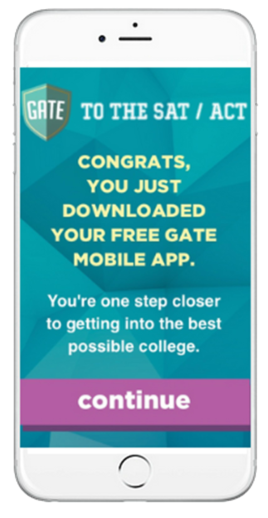 The mobile app GATE offers as a free gift to all students on iOS and Android, GATE to the SAT/ACT, was created by a team of professional educators with over 100 years of combined experience in classrooms and tutoring agencies from New York to our home offices in Los Angeles. For school communities with families who need support but struggle to help feed and shelter their families, GATE is committed to providing pro bono and corporate sponsored access for disadvantaged schools who can use a little help. Here’s why test prep and the road to college admissions must change: these are students, not customers. Lives are at stake. GATE believes that America can and must do better than becoming a corporatocracy where the sole access to success is a pay-to-play endeavor.